Hong Kong, the Special Administrative Region of the People’s Republic of China. Many people flock to Hong Kong mainly for eating, shopping and the various attractions! There is Hong Kong Disneyland, Ocean Park Hong Kong, Ladies’ Market, and many more! Of course, you will need to try their famous roast meats, dim sum and the wonderful Hong Kong-style milk tea! It tastes really different. Cheung Chau Island is a relatively small island located of the southwest side of Hong Kong Island. Please do not be mistaken by the size of the island, there are various activities and attractions that you can do there as well! To get to Cheung Chau Island, you will need to take the MTR to the Central station or Hong Kong Station and then just follow the directions to the piers to take a boat ride to the island! Do take note that there are timings available for the boat rides. All of them are stated clearly on the boards provided at the pier, each boat ride is about 15 to 20mins apart. If you notice there are 2 kinds of timings on the same board, this represents the 2 kinds of boats that you can take, the fast or the slow. The “slow” boat takes you about 55 mins to get to the island, of course is cheaper. The “fast” boat costs you a little bit more, but is still considered cheap, but takes you 35 mins to get to the island. 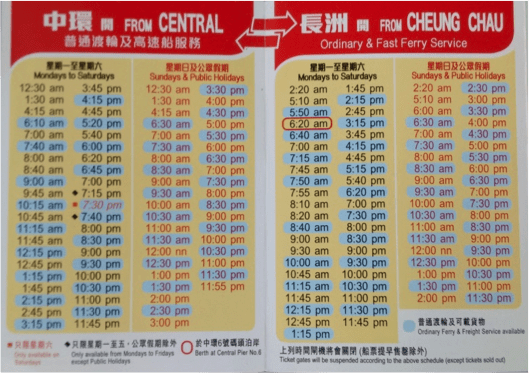 Boat timing from Central, Hong Kong to Cheung Chau. If you happen to be on the island or if you decide to go to the island on the 5th to 9th days of the 4th Lunar Month, do check out the Cheung Chau Bun Festival. This is one of the famous festivals on the island where people return to their homes to celebrate. Besides that, you can also check out the hiding place of pirates in the Cheung Po Tsai Cave. If you are there, do continue to check out the unusual rock formation known as the Reclining rock! You can also take a stroll along the Cheung Chau seafront at Cheung Chau Sai Tai Road, or you can visit the Mini Great Wall as well or even Cheung Chau’s highest vantage point at the North Lookout Pavilion. If you are a fan of temples, you can go visit the Kwan Kung Pavilion, the Pak Tai Temple or the Tin Hau Temple at Sai Wan. And of course, being near the seafront and home to various fishermen, one does not leave the island without enjoying fresh seafood from the various restaurants that can be found on the island. While there are many places to visit and things to eat on the island as well, you must not miss out the mochi made from glutinous rice which one of the specialty on the island. ← Colmar, the fairytale town in Alsace.